As a young boy, Theodore Roosevelt often struggled to breathe at night because of his asthma. Although modern doctors would be appalled, Roosevelt’s doctors suggested that the boy smoke cigars to improve his symptoms. The family thought Roosevelt’s brother, Elliot, later father of Eleanor Roosevelt, was most likely to succeed. Elliot struggled with alcoholism, however. Theodore soon outpaced his brother both physically and mentally. He was a voracious reader and would read almost anywhere about almost any subject. Even as president he snuck a few minutes between appointments to read nature books. While in office he expanded the authority of the president. Roosevelt believed that the president could do whatever the law didn’t specifically prohibit him from doing. 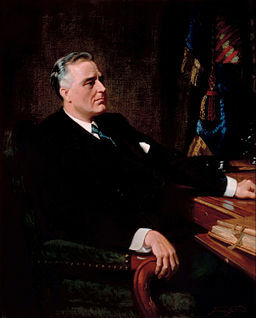 Roosevelt engaged in a number of presidential firsts. He was the first president to understand and use the press to gain public support for his programs. In fact, Roosevelt enjoyed talking with the press so much that he spoke to a reporter during his morning shave. Roosevelt was also the first president to invite an African American (Booker T. Washington), to dinner at the White House. Although he enjoyed being president, Roosevelt was disappointed to preside over the country in a time of peace. He believed that he could not be a great president without steering the nation through a great crisis. Though he was a Democrat and his distant cousin Theodore a Republican, Franklin always admired Theodore. Theodore gave his cousin Franklin his blessing on more than one occasion. He supported Franklin’s marriage to his niece, Eleanor. He also supported Franklin’s desire to become a politician. 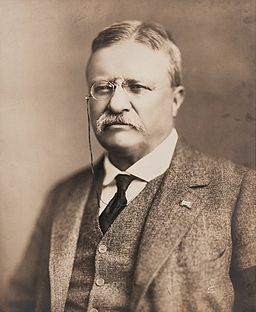 After Theodore’s death, animosity grew between the two branches of the Roosevelt family. Theodore’s sons saw themselves as the natural heirs to their father’s success, but none of them came close to Franklin’s political achievements. After a series of political appointments, FDR was diagnosed with polio. In 2003, scientists called that diagnosis into question. They suggested that FDR might not have had polio, but Guillain-Barre syndrome, an aggressive form of neuropathy. Regardless of the medical cause, FDR’s paralysis made him terrified that he might become trapped in a fire. His home at Springwood near Hyde Park, NY has an elevator that FDR could operate by pulling ropes in case the electricity failed. Like his cousin Theodore, FDR had a good relationship with the press as president. As a result, he was rarely photographed in his wheelchair. While trying to get the nation out of the Great Depression, he created a variety of government programs that became well-known. There was almost nothing FDR would not try in order to stimulate the economy. For example, he tried to move the Thanksgiving holiday backwards so that consumers would have more shopping days before Christmas.